Millet or Quinoa this is here the question . Many know Quinoa from the health food markets and have used it. But what about Millet ? You know millet only as a bird food and are curious if it can be used for a meal? Millet is an ancient grain . In Africa, it is for 78% of the population the main source of protein. Cultivated there for about 6,000 years.In India, it is used to make roti. Indian vegetarian love millet, it is rich in fiber. It helps with complex carbohydrates to meet the daily protein . In Ethiopia, people make porridge with Millet and Caribbean cook it with beans and peas. Quinoa as well is a source of fiber and protein . Both Quinoa and Millet have anti-inflammatory benefits and hold the blood sugar level stable. This makes it a good food for people with diabetes. Read below more about these two seeds. 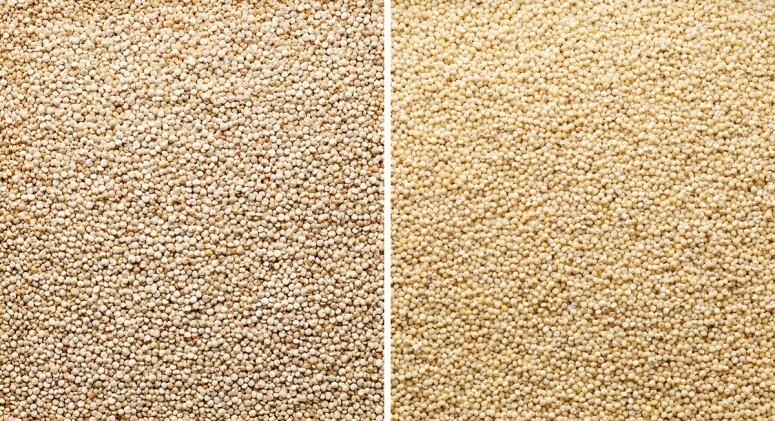 See, Millet or Quinoa which one of these healthy grains do you prefer?Best may be to include both of them in your diet. It appears as small round, yellow balls that look somewhat like birdseed—but don’t let that turn you off. Its ability to be used in a variety of foods, as well as a high nutrient content and suitability for those with Celiac disease or gluten intolerance, has placed it in the spotlight in recent years. In fact, millet is fast becoming a staple in some developing countries, and for good reason, since it’s packed with energizing B vitamins and protein as well as filling fiber that can help with weight management and digestion. It also has good doses of calcium, which helps maintain the health of bones and teeth, as well as magnesium, a mineral touted for its anti-inflammatory effects.